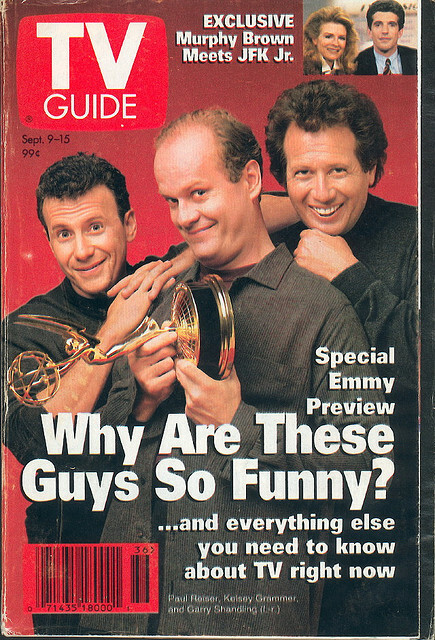 A September 9, 1995 issue of TV Guide. - Oof that&apos;s a painful headline I just wrote. But Paul Reiser will be at Zanie&apos;s in Rosemont on September 8. Other upcoming shows at Zanies (in Chicago) include Steve O from Jackass and Emo Philips. - It&apos;s the summer of free Shakespeare outside: Monday through Wednesday at 6:30 pm this week you can The Taming of the Shrew at the south lawn in front of Navy Pier. - And are you a young person who would like to get drunk with other opera lovers whilest listening to your favorite thing, opera? "On August 23rd, Chicago Opera Theater’s (COT) Opera Underground - COT’s young person’s social club - will start a new tradition with its first annual Booze Cruise – “I’m On A Boat!”. Guests will coast down the Chicago River and Lake Michigan on Chicago Cruises’ &apos;Summer of George.&apos; They will enjoy refreshing wine, beer, a delicious assortment of hors d’oeuvres, and opera selections performed by COT singers." I wish that this had been my idea. The ticket is $40 ahead of time and $50 at the door, which includes "a wine and beer bar with light hors d’oeuvres." - Chicago Live! is no more, reports Robert Feder -- at least not in it&apos;s current incarnation.